The Beechcraft C-12 Huron is the military designation for a series of twin-engine turboprop aircraft based on the Beechcraft Super King Air and Beechcraft 1900. C-12 variants are used by the United States Air Force, United States Army, United States Navy and United States Marine Corps. These aircraft are used for various duties, including embassy support, medical evacuation, as well as passenger and light cargo transport. Some aircraft are modified with surveillance systems for various missions, including the Cefly Lancer, Beechcraft RC-12 Guardrail and Project Liberty programs. The first C-12A models entered service with the U.S. Army in 1974 and were used as a liaison and general personnel transport. The aircraft was essentially an "off-the-shelf" Super King Air 200, powered by the type's standard Pratt & Whitney Canada PT6A-41 engines. A U.S. Air Force variant of the plane for surveillance roles primarily over Afghanistan and Iraq was the MC-12W Liberty. For that variant, Beechcraft built the basic plane and then sent it to Greenville, Texas where sophisticated intelligence, surveillance and reconnaissance (ISR) equipment was installed by L-3 Communications Missions Integration. As of 2013 the Liberty program had exceeded 300,000 combat flying hours. 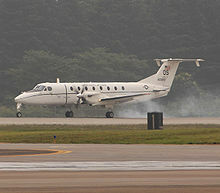 The MC-12W was rushed into combat as a supplemental surveillance and signals intelligence asset; since its first combat mission on 10 June 2009, the aircraft flew 400,000 combat hours in 79,000 combat sorties, aiding in the kill or capture of “more than 8,000 terrorists” and uncovering 650 weapons caches. With its roles taken over by the growing MQ-9 Reaper fleet, the Air Force decided to divest itself of the 41 Liberty aircraft and turn them over to the U.S. Army and U.S. Special Operations Command, which was completed by October 2015. The Air Force's final MC-12W deployment in support of Operation Enduring Freedom ended on 13 October 2015. To meet the needs of transporting larger groups, the U.S. Army purchased six C-12J aircraft, based on the Beechcraft 1900C commuter airliner. One of the military C-12Js is used for GPS jamming tests at the 586th Flight Test Squadron, Holloman Air Force Base, New Mexico. Another is based at the 517th Airlift Squadron, Elmendorf Air Force Base, Alaska. Three were based at the 55th Airlift Flight, Osan Air Base, South Korea. They have been relocated to the 459th Airlift Squadron, Yokota Air Base, Japan. The remaining two are used by U.S. Army Aviation. The TC-12B Huron was a twin-engine, pressurised version of the Beechcraft Super King Air 200. Twenty five served with the US Navy with training Squadron 35 (VT-35), the US Navy's only TC-12B Huron squadron based at Naval Air Station Corpus Christi, Texas, home of the Training Air Wing 4 (TAW-4). The US Navy retired this aircraft on the 16th of May 2017 and replaced and now relies on the T-44C for multi engine training. Although the UD- series 1900s were manufactured exclusively for military use, the United States military and other military and government organizations use 1900s from other series such as the UB-series 1900C, and 1900Ds which may be found elsewhere. Used by the U.S. Army for liaison and attache transport. Based on the King Air A200 (serial numbers BC-1 through BC-61, BD-1 and up). U.S. Navy/U.S. Marine Corps version with an additional cargo door. Based on the King Air A200C (serial numbers BJ-1 and up). U.S. Navy single-aircraft version, UC-12B BuNo 161311 equipped with four P-3C type Sonobuoy launchers. U.S. Navy training version developed by conversion of UC-12B airframes. U.S. Army and U.S. Air Force version of the C-12A with upgraded engines. Based on the King Air A200 (serial numbers BC-62 and up). U.S. Army and U.S. Air Force version. Based on the King Air A200CT, changes include larger cargo door, "high-flotation" landing gear (a Beechcraft option for larger main landing gear wheels for use on unimproved runways) (serial numbers BP-1, BP-22, BP-24 through BP-51). Special mission, SIGINT aircraft for the U.S. Army. Based on the King Air A200CT (serial numbers BP-7 though BP-11). Upgraded C-12A aircraft for the USAF. 29 C-12As were retro-fitted with two Pratt & Whitney Canada PT6A-42 turboprop engines. U.S. Air Force transport version. Based on the King Air A200CF (serial numbers BP-52 through BP-63) and the King Air B200C (serial numbers BP-64 and up). U.S. Navy version of the UC-12F modified with surface search radar. U.S. Navy version based on the King Air B200C (serial number BU-1 and up, BV-1 and up, BW-1 and up). Cockpit upgraded to Proline 21. U.S. Army version used for real-time tactical intelligence support under the Crazyhorse program. Based on the King Air A200CT (three aircraft, serial numbers FC-1 and up). Previously operated by U.S. Army Reserve aviation units. Special mission, battlefield SIGINT aircraft for the U.S. Army. Three A200s acquired for use in the Cefly Lancer program as RU-21Js. In 1984 the three aircraft modified with new VIP interiors, and returned to the U.S. Army as C-12Ls. U.S. Navy version. Cockpit upgraded to Proline 21. U.S. Navy version. Upgraded cockpit instrumentation, plus other systems and structural upgrades. Off the shelf BE200 modified with EFIS glass cockpit instrumentation. Upgrade of earlier U.S. Army C-12F versions with improved cockpit instrumentation. Upgrade of U.S. Army C-12T versions with improved cockpit instrumentation in order to meet global air traffic management directives. Special mission, battlefield ELINT aircraft. Three A200s were brought by the U.S. Army for use in the Cefly Lancer program in the early 1970s. MULTI-INT ISR platform. The MARSS provides the commander with a multi-intelligence collection capability to accurately detect, identify, and report threat targets in near real-time. IMINT, COMINT and ELINT intercept capability. As of June 2010, 11 MARSS were created from outfitted Beechcraft King Air B-300 aircraft. 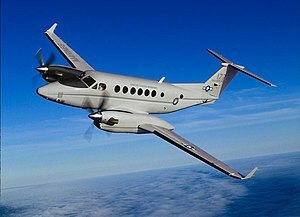 U.S. Army version based on the King Air 350, with seating for 8 to 15 passengers and quick cargo conversion capability. USAF version modified for the Intelligence, Surveillance & Reconnaissance (ISR) role; originally 8 King Air 350s and 29 King Air 350ERs and ending with 42 350ERs (including one combat loss). In service since June 2009 in Iraq and Afghanistan and globally for USSOCOM. All aircraft were transferred to USSOCOM, US Army, and other US government agencies by 2015. A U.S. Air Force Beech C-12J Huron lands at Yokota Air Base, Japan, on 29 June 2007. Used by the U.S. Air Force's Pacific Air Forces, and Air Force Materiel Command. It carries 2 crew and 19 passengers. The C-12J is based on the Beechcraft 1900C and carries the serials UD-1 through UD-6. The Air Force currently operates only 4 C-12Js. 3 are operated by the 459th Airlift Squadron at Yokota Air Base, Japan and 1 by the Air Force Materiel Command from Holloman AFB, New Mexico. The Army has C-12Js in use. The following RC-12 variants, although similar to earlier RC-12's based on the KA-200, represent specially built airframes that combined upgraded engines (1,100 shp PT6A-67) and structural upgrades (swapping the traditional KA-200/300/350 T-Tail for the 1900 modified T-Tail to compensate for torque and aerodynamics and having reinforced spars to compensate for the increased maximum gross weight - up to as high as 16,500 lbs). U.S. Army Guardrail Common Sensor system aircraft. Intelligence-gathering platform. 14 ordered, the first delivered to the U.S. Army in January 2011. Note: The U.S. military also operates other King Air versions under other designations, including the C-6 Ute and T-44 series. In addition, there are a number of Beechcraft 1900s operated by the military under civilian registrations, using their civilian model designations. ^ a b "King Air timeline from". Wings over Kansas. Archived from the original on 3 June 2011. Retrieved 11 June 2016. ^ Trujillo, Robert M. (8 October 2013). "MC-12W Liberty exceeds 300,000 flying hours". www.acc.af.mil. 9th Reconnaissance Wing Public Affairs. Archived from the original on 26 September 2015. Retrieved 11 June 2016. ^ "Air Force Fact Sheet". Holloman.af.mil. Archived from the original on 26 May 2011. Retrieved 26 May 2011. ^ "Joint Base Elmendorf-Richardson – Home". Elmendorf.af.mil. Retrieved 26 May 2011. ^ Pike, John (27 April 2005). "C-12J at Global Security.org". Globalsecurity.org. Archived from the original on 25 May 2011. Retrieved 26 May 2011. ^ a b "Army aviation web page". Usarmyaviation.com. Retrieved 26 May 2011. ^ Pike, John (26 April 2005). "Special Electronic Mission Aircraft listing at". Globalsecurity.org. Archived from the original on 25 May 2011. Retrieved 26 May 2011. ^ Harding, Stephen (1997). U.S. Army Aircraft Since 1947. Atglen, PA, USA: Schiffer Publishing Ltd. p. 30. ISBN 978-0-933424-53-1. ^ a b Pike, John. "Medium Altitude Reconnaissance and Surveillance System (MARSS)". www.globalsecurity.org. Retrieved 28 June 2017. ^ "Curtain Goes Up on Project Liberty". Air Force Magazine. Archived from the original on 24 May 2011. Retrieved 12 June 2016. ^ Vanden Brook, Tom, "Newest Manned Spy Plane Scores Points In War Effort", USA Today, 2 June 2010, p. 5. ^ Jennings, Gareth (10 November 2014). "USAF outlines divestiture plans for MC-12W Liberty aircraft". www.janes.com. IHS Jane's Defence Weekly. Archived from the original on 11 November 2014. Retrieved 11 November 2014. ^ McCoy, Daniel (18 May 2010). "Hawker rolls out first UC-12W". ^ "Northrop reveals interest in new upgrade for RC-12X". 14 February 2011. Archived from the original on 17 February 2011. Retrieved 14 February 2011. ^ Jackson, Paul; Munson, Kenneth; Peacock, Lindsay (2005). Jane's All the World's Aircraft. Jane's Information Group. ISBN 978-0-7106-2684-4. Wikimedia Commons has media related to Beechcraft C-12 Huron.